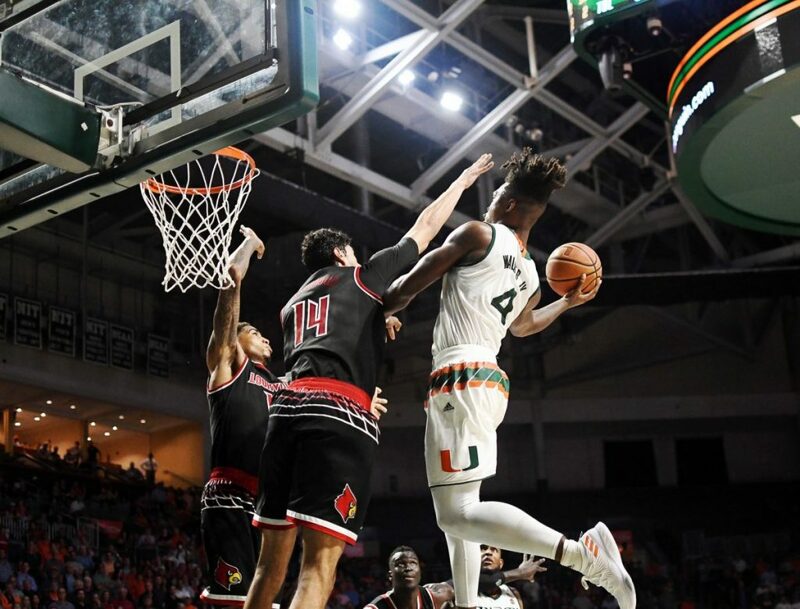 Last week, Lonnie Walker IV said he didn’t feel like a true freshman anymore after getting some experience playing in the ACC. 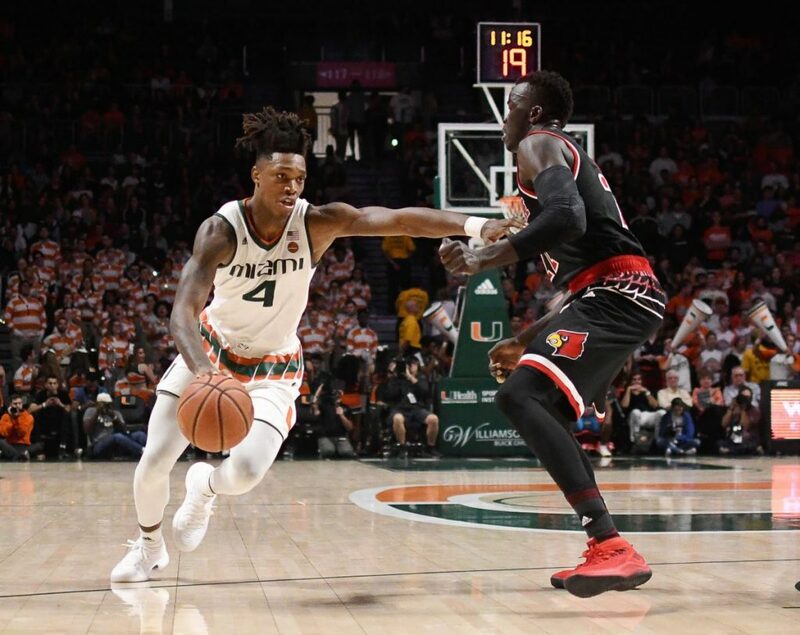 He didn’t look like one either, scoring 25 points – one shy of his career high – in a 78-75 Miami Hurricanes overtime victory over the Louisville Cardinals Wednesday night at the Watsco Center. The Canes (15-4, 4-3 ACC) were down 69-67 in regulation with just 13 seconds to find a bucket. Walker was the answer, going up against two Cardinal defenders for an acrobatic layup to tie the game and send it to extra minutes. In overtime, UM sealed the win with a Dewan Huell put-back dunk, free thows and a Walker block in the closing seconds. Miami has now won back-to-back times in conference play for the first time this season. Walker scored in double-figures for the fourth-straight game, and Huell, a sophomore forward, notched his fourth double-double of the season with 18 points and 12 rebounds. Louisville (15-5, 5-2 ACC) had a balanced offensive attack, featuring strong showings from senior guard Quentin Snider, and junior forwards Deng Adel and Ray Spalding. Snider led the scoring with 18 points, Adel had 13 and Spalding pulled down a game-high 13 rebounds. Adel has scored in double figures in 22 of his last 23 games dating back to last season, but the loss snaps a Cardinals’ four-game winning streak. Walker scored 20-plus points for the first time since scoring a career-high 26 in a win over Boston University Dec. 5. He is just the second freshman in Miami history to score 25-plus points in two games during one season, the first being sophomore guard Bruce Brown. Brown struggled from the field, scoring just eight points on 2-of-10 shooting but added 11 rebounds. The game was just about even statistically in the first half, as the teams traded buckets throughout. The Cardinals held a 38-37 lead at halftime. This back-and-forth scoring continued until the final buzzer. Padgett took the job after long-time coach Rick Pitino was dismissed in September 2017 because of an FBI investigation. Miami was unable to hold its opponent under 60 points, something it had done nine times this season. The Hurricanes attempted 31 free throws – they made 22 of them – which is one shy of their season high. Miami next faces a tough test on the road at 4 p.m. Saturday, Jan. 27, at Florida State. The Hurricanes hope to keep their success this season against FSU alive, as they won 80-74 at home Jan. 7. Louisville’s next game is at home at 8 p.m. Saturday, Jan. 27, against Wake Forest. The Demon Deacons are only 1-7 in conference play.